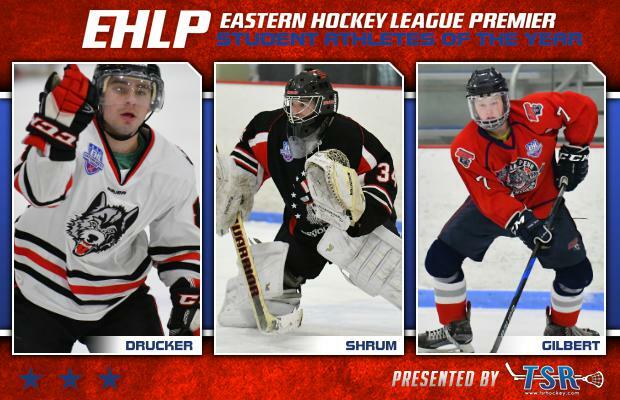 BOSTON, MA -- The Eastern Hockey League Premier is pleased to announce that Jake Drucker (New England Wolves), Anthony Shrum (Philadelphia Revolution), and Wes Gilbert (Central Penn Panthers) have been named the 2017-18 Student-Athletes of the Year. Each player turned heads both on the ice and off the ice, exemplifying the idea of being a 'student-athlete.' Whether it was community service hours, or additional time spent studying, each individual set themselves apart from the rest. For this year's new award in the EHLP, each team submitted their own candidate and the league officials determined the final award winners. 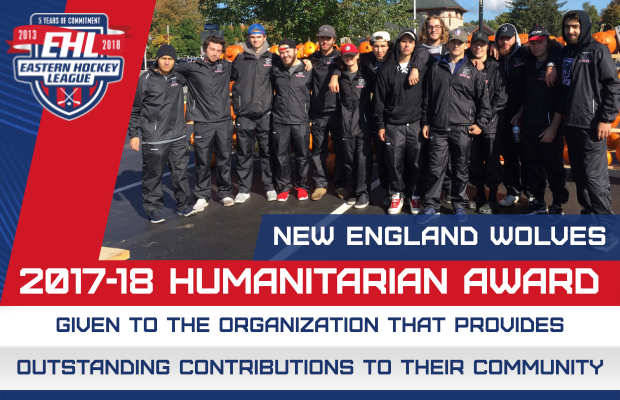 "Just like our new Humanitarian Award, we sought out to find a way to honor some of the top individuals in the EHLP," said Mark Kumpel, the EHLP's Director of Hockey Operations. "Our organizations are helping these players grow as young men, and much of this growth takes place away from the rink. Of course what takes place on the ice is important, but all the college coaches also ask about what takes place when our guys aren't playing hockey. The college coaches are looking for players who will help them win hockey games, but also earn an education while they play. These three individuals all have very bright futures ahead of them, because they are dedicated to aspects of their life other than hockey. On behalf of the EHLP, I would like to congratulate Jake, Anthony, and Wes, for all the work they put in this past year." Drucker and the Wolves put together a solid year as they advanced to Second Round of the EHLP Playoffs, losing to the eventual EHLP Champions in the Boston Jr. Rangers. The '98 forward continued to develop while tallying 12 points in 31 total games, and away from the rink, he was a key contributor to the Wolves team that also was named Humanitarians of the Year. "Jake is a well rounded, team-first player, who gives his best effort in all his endeavors," said Wolves head coach and general manager Andrew Trimble. "He has a very bright future ahead of him and I'm sure he will excel both on and off the ice. He is an excellent choice for this award, and the Wolves are proud of his accomplishment." Shrum and the Revolution had another great season in the EHLP, falling just short against Philadelphia Jr. Flyers in the South Conference Finals. The '99 netminder was the anchor for his team, while racking up over 30 saves in all four of his team's playoff games. Away from the rink, the native of Michigan has his sights set on becoming a Nuclear Engineer in the future. His list of options for college is impressive, and it's due in large part to his 4.3 GPA and 31 ACT. "Anthony is one of the brightest players that I have ever coached," said Revolution head coach Justin Grevious. "He attends one of the top public high schools in Michigan, and has the bar set very high in terms of his career aspirations. Along with being such a phenomenal student, Anthony is a great goaltender who made some incredible saves this season. I can't wait to see where he ends up both academically and athletically." Last, but certainly not least, Gilbert was one of the youngest players in the EHLP this past season. The 2001-born defenseman tallied 32 points in 42 total games for the Panthers. Away from the rink, Gilbert attends the Lancaster Country Day School, which is regarded as one of the elite, private schools in Pennsylvania. “Wes is a great kid, from a solid CPP family," said Panthers general manager Wil Younger. "He is the second Gilbert to wear a Panthers sweater. All season he was able to maintain all honors and AP courses while playing both Junior Hockey and Lacrosse. Aside from being a solid player for us, he is a NCAA Division I recruit for Lacrosse. He was a very dependable defenseman, and filled in as a forward a few games when called upon."